"Fiber cleans mucus from the intestinal tract, lowers cholesterol, and helps with weight loss!" From teeth to toilet, your digestive track is nothing more than an efficient juice machine. That mass of food on the end of your fork is simply too enormous for a human cell to assimilate, so it is the job of the digestive system to break down human food into cell food. First, teeth and saliva go to work much like a blender, chewing solids into a creamy mash. Saliva lubricates and binds masticated food so that it may easily slide down the esophagus without damaging it. Saliva initiates digestion of starch by secreting the enzyme alpha-amylase. The collective message from conscientious mothers to chew your food is sound advice, especially in our fast-paced lifestyle where lunch is inhaled on the fly. This mostly unchewed food crashes into the stomach, where 35 million glands pump out about three quarts of hydrochloric acid a day, further breaking down food. Next comes the 26-foot-long journey through the intestines, our food processing plant. The lower intestine or five-foot-long colon contains a zoo of over 50 varieties of microbes totaling in the trillions. The intestinal wall consists of ninety square feet of absorptive surface covered in millions of fingerlike projections called villi. The villi take the liquefied vital nutrients from the intestine and circulate them via the bloodstream to every cell of your body. There you have it, from fork to cell. But what about the stuff left behind? Speaking about the behind, let’s take a closer look. Our bodies need fiber to keep the elimination process working efficiently. There are two types of fiber—soluble and insoluble. Soluble fiber dissolves in water. In the blood, soluble fiber helps lower serum cholesterol by binding with low-density lipoproteins. Water-soluble fiber can be found in apples, oranges, oat bran and beans. Insoluble fiber is the substance in food that cannot be digested or absorbed by the intestine. This category includes pectin, cellulose, hemicellulose and gums. 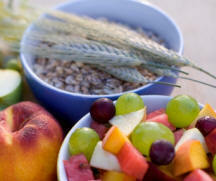 Fiber is found only in plant foods such as fruits, vegetables, nuts, beans and whole grains. Eggs, dairy products, and meats contain no fiber. A good rule of thumb is that animal foods contain zero fiber; but unprocessed plant foods are rich in needed soluble and insoluble fiber. Of all the vital organs, the one that takes the greatest beating from of our modern diet is the colon. The colon draws out liquid even after stools are fully formed. If stools do not move quickly through the colon they become hardened and dry, causing constipation. The number one cause of a slow transient time in the colon is lack of fiber in our diet. It is clear the human digestive system was not created for the North American diet. Fast food and a high-meat diet are not suited for a human colon. A diet high in whole foods, on the other hand, results in a healthy intestine, swept clean by the tiny broom-like fibers found in abundance in fruits and vegetables. Studies found that cultures where people eat a high-fiber diet have a much lower incidence of diverticulosis, which affects 30 million Americans. A weakening in the large intestinal wall caused by the pressure from hard feces produces this disease. The American Journal of Digestive Disorders reported that 85 percent of diverticulosis sufferers were successfully treated with a high-fiber diet. Fiber cleans mucus from the intestinal tract and lowers cholesterol. The abundance of soft fiber has the added benefit of removing toxins that have set up home in the colon. Due to their complete lack of fiber, animal products pass through the intestine slowly, allowing time for proteins to ferment and producing harmful bacteria. These harmful bacteria secrete carcinogenic by-products that can damage the intestine. If you are going to eat a meal high in meat or cheese, I recommend you have a good portion of vegetables like salad or cooked broccoli. The fiber in vegetables is able to increase transit time through the colon, reducing fermentation, neutralizing some of the toxins in the bowel. However, don’t be fooled by the iceberg salads smothered in trans-fatty dressing offered as a token side dish with your burger and fries. There is almost no fiber (or vitamins) in iceberg lettuce. Request romaine lettuce with a light dressing. If your favorite restaurant thinks romaine is a foreign country, say a friendly farewell and find a new filling station. I have saved the best news till last. Plant foods are bulking, fiber-filled, low-density food. If that doesn’t excite, you let me translate this into something that will: weight loss. You will never get fat on fiber. An entire head of broccoli has less calories then a teeny tiny piece of cheese. Unfair, but believe me when I say you can learn to enjoy your broccoli. I will steam my broccoli and add a half a tablespoon of butter for flavor; that’s only 50 calories of fat, but who’s counting. And some of the butter will stay in the fiber and pass through. I know people who would deprive themselves of butter on their broccoli but sneak a chocolate bar as deprivation therapy. Silly. For heaven’s sake, add a little butter, a sprinkle of sea salt and seasonings, than enjoy your broccoli, Brussels sprouts and green beans. It’s all about wisdom, not oppression. A tyrannical diet program will always lead to bingeing and compulsive eating. Very well-written. After being diagnosed with breast cancer, I began daily enemas and eating a mostly raw organic diet of fresh fruits and vegetables. This has changed my life for the better. I also am taking and implanting naturally fermented liquids. REALLY A VERY HELPFUL ARTICLE. VERY WELL WRITTEN. THANKS!